Great News to all Triad Kannada Members!!!! We have been very fortunate this season in terms of hosting several cultural events from Triad Kannada Association. Following, Sri Shudra Srinivas’s address in Greensboro, we are overjoyed to announce another unique Cultural event that is bound to mesmerize all of you. 3304 Groometown Rd, Greensboro, NC 27407 between 4pm and 10pm. Dinner will be served at the end of the event. 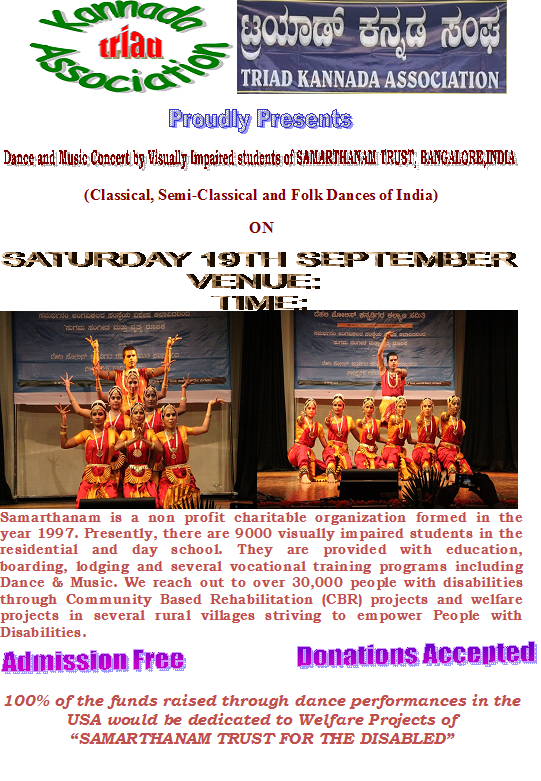 Entry fee is $10, but we seek generous donation (Which are tax deductible) by all of you to encourage and support the disabled artists of Samarthanam. Please RSVP as soon as possible so that we can make arrangements.